Instead of gazing at the stars, I’m flying among them where no tween has been. These are the writings of Aria Vanir aboard the Gallion superspaceship, Rama XI, during my unexpected alien adventure for first contact with Queen Supreme Nashata, Galactic Mother of the Gallions. First contact with Queen Supreme Nashata, Galactic Mother of the Gallions, transforms psychic tween Aria Vanir into Earth Ambassador to the Gallions. Can Aria summon the courage to tell humans about the Gallions’ peaceful messages of love, infinity, and prosperity? For this, she turns to her most trusted companion: her diary. In this second book of the science fantasy Mystical Aria series, Aria’s space adventure unfolds through her innermost thoughts as she reveals her visions, dreams, and inner conflicts. Get the scoop on new additions from her teen spy sis Jackie, BFF Tommy, and galfriend-for-life Princess LeSom. 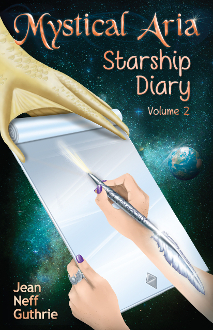 Check out the brand-new Aria’s Universe for exclusive interviews with aliens aboard the starship Rama XI. Why does Princess LeSom like Elvis so much? What initiation did Peakte endure to emerge as the Gallions’ greatest inventor? How did alien queen Nashata meet her favorite communicorn, Shemuse, and accept her royal destiny? Stories from these good aliens inspire Aria to believe there might be a safe place in the world for her secret, psychic talents.